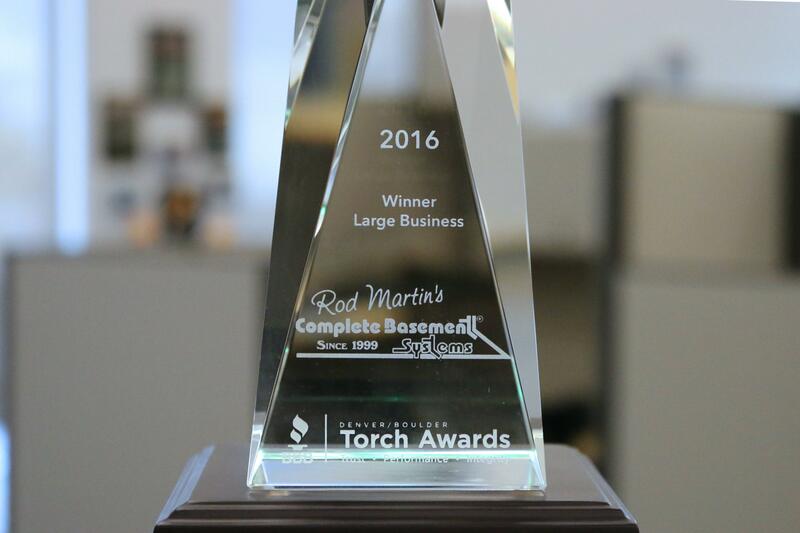 Rod Martin's Complete Basement Systems has won the 2016 BBB Torch Award For Marketplace Ethics for a Large Business. Rod Martin's Complete Basement Systems has added yet another prize to the trophy case. The company was the recipient of the 2016 BBB Torch Award in the Large Business category on October 20, 2016. The event was held at the Infinity Park Events Center, where the Better Business Bureau honored all of this year’s semifinalists. The event featured keynote speaker and former Denver Bronco, Reggie Rivers. While the company was a semifinalist for the 2015 BBB Torch Award in Denver, 2016 marks the first time Rod Martin's Complete Basement Systems has won the prestigious award. The BBB gives Torch Awards in five categories – Large Business, Medium Business, Small Business, Large Nonprofit, and Small Nonprofit. According to the Better Business Bureau, “The Torch Award for Marketplace Ethics is the most prestigious award the BBB can present to a business or nonprofit.” In order to compete for the award, businesses and nonprofits go through an extensive review and interview process to demonstrate their commitment to ethics and excellence. An independent panel of judges grade companies based on five criteria, including management practices, community/investor/stakeholder relations, marketing practices, and industry reputation. These criteria are based on the standards developed by the Council of Better Business Bureaus for the International Torch Awards. The year 2016 has been filled with awards and accolades for Rod Martin’s Complete Basement Systems. In addition to the Torch Award, the company was the recipient of The Denver Post’s Top 100 Workplaces Award, as well as the Foundation Supportworks’ Integrity Award - an award given out yearly by the Foundation Supportworks International dealer network to recognize positive business ethics. Max has over five years of experience leveraging social and content marketing efforts for small businesses and startups across the Denver metro area. As a professional writer and content marketer, he is a frequent contributor to The Washington Park Profile, and has also contributed to Aboutboulder.com, and The Rocky Mountain Brew Review. Max joined the Rod Martin's Complete Basement Systems team in 2016, and coordinates the deployment of all web-based content for the company.